This very smart, genuine, Series 111 Station Wagon has the benefit of 2.5 litre, four cylinder 200 tdi Turbo diesel engine fitted making it much more economical than the original unit and, with the higher ratio differentials fitted to this car, much longer legged and able to cruise at higher speeds. The conversion is very well executed and it looks as though the engine has always been there. 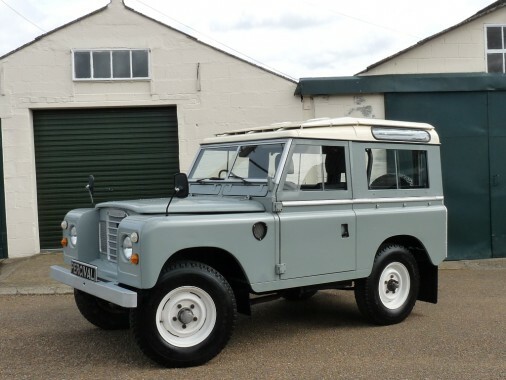 It has Free Wheeling Hubs, an electric engine fan and the original Safari roof. The Land Rover has been restored by a knowledgeable enthusiast. The underside is superb with everything clean and painted and evidence of new bushes and steering work. The chassis, outriggers, suspension and steering components are all painted and detailed. We have overhauled the brakes with new drums and brake shoes. There is no corrosion to attend to. The bodywork is clean and straight with good paintwork and fixtures. There are very few dents and no Chequer Plate! The rear crossmember, bulkhead and footwells are all excellent as are the door bottoms. The front seats are new and all seven seats have seatbelts. Most of the floor covering is also new. Foley Specialist Vehicles of Harlow supplied the Land Rover last year to a mutual customer and he had them fit a discreet internal roll cage at great cost, thereby transforming the safety of the car as there is little or no strength in the bodies of these vehicles. The driver's seat runner was modified to allow for taller drivers although 'normal' folk can still reach the pedals.